I have finished the first 10 percent of my service in the army, and one of my friends told me that it's like I have finished my first piece of pizza from my whole pie. I'm still really excited about my army service, but I anticipate that might change as I keep eating this pizza pie which is the IDF! Finishing my last course, Course Ivrit (Hebrew), was very rewarding but also sad. All the comfort of having people around me who speak English is now slowly disappearing. I have to use Hebrew more and more, and I think it is improving the way I speak more than the actual course did. On March 4, I participated in the closing ceremony (tekes) of my course. 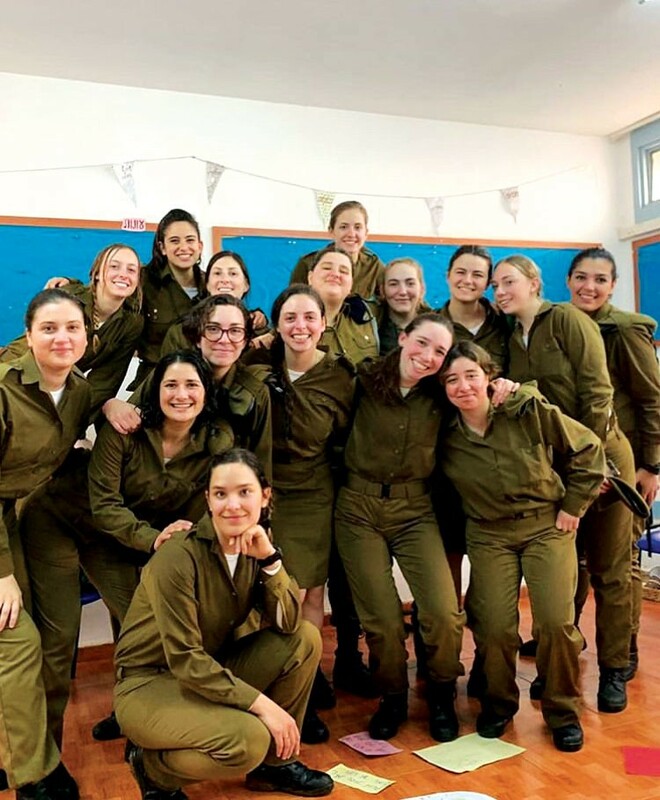 Over 450 soldiers graduated the course, including two companies of new immigrant boys, one company of Druze boys, and my one company of new immigrant girls. If you don't know what the Druze religion is, you should definitely look it up because it is really interesting and I am grateful to have shared a base with them. My aunt, uncle and 7-year-old cousin came to see my ceremony, along with my kibbutz host family and some friends. It was great having support from so many people in Israel as well as my family abroad. The ceremony started with everyone walking by platoon in rhythm with each other, and boy, is it hard to walk at the exact same time as all 450 other soldiers. People here do not have coordination. We stood at attention and then in a "comfortable" position with our hands behind our back. Let me tell you a secret—after a half hour of standing this way, it's not that comfortable. There were speeches and, of course, the national anthem, Hatikvah, was played. Some of the parents who attended got emotional. Thankfully, the rain stayed away until the last part of the ceremony when we all ran into the center of the area and threw our berets up in the air. After the ceremony, everyone received their job assignment that they will be doing in the army. Sad to say after all the happiness that I was assigned a job that I did not want at all. I decided to advocate for myself, so I went to the central Tel Aviv army base the next day (unannounced and not really allowed) and asked to switch my job. The army has recently raised the bar of what Hebrew level you need in order to be in a combat unit. My good friend, also a lone soldier, has been doing Course Ivrit with me and did not receive a score that was high enough to do combat. She came along with me and argued her way (in Hebrew I might add!) into a meeting with an officer. She was convincing enough to get into the unit she wanted. I also got to switch assignments. Although I am not sure on the specifics of my new job yet, I am now in the Air Force. The picture included this month is of me and my tzevet (group). I'm still wearing my green army uniform. The next time you'll see a picture of me, I'll be in the tan Air Force uniform! Helaina Zahn is an Allentown native who attended Hebrew school at Temple Beth El and graduated from Parkland High School. She graduated from Temple University before making aliyah and joining the IDF.